Plastic has recently been a popular subject of wide public debates. The discussions have mainly focused on the environmental hazards of plastic, although plastic has many environmental benefi ts too. Cucumber, for example, will stay fresh for two weeks when packed in plastic fi lm, but without it will go bad in just three days. PLASTIC HAS recently attracted a great deal of publicity, and the tone of the resulting debate has seldom been positive. “I’m sure most experts in the packing industry are irked by the biased approach where fingers are frequently pointed, but the truth is that in many cases plastic is an absolutely unbeatable and even essential alternative compared to many other packaging materials,” says Product Development Director Mats Albäck from Rani Plast. He points out how plastic used as a packaging material reduces food waste, as shown by the cucumber example. Food waste is a global problem, but with the right plastic packaging it can be significantly reduced. “Despite the bad publicity it has attracted lately, plastic is an extremely versatile and, contrary to popular belief, often the most environmentally friendly material, compared to other packaging solutions. Of course it has to be used and recycled correctly,” Albäck continues. ALTHOUGH PLASTIC has been singled out as environmentally harmful, it is still a material that is used extensively. Its popularity and uniqueness arise from its lightness combined with its other qualities, such as mechanical strength. According to Mats Albäck, plastic is such a great packaging material that it would be very difficult to replace it, at least in a way that is economically viable and that would not burden the environment more. This is because light packing solutions generate savings in transport and consequently delivery trucks produce less emissions. “With plastic packaging, a truck can be loaded with more products than with heavier packaging materials. And plastic packaging allows insulation materials used in construction, for example, to be compressed into a small space,” Albäck points out. JOHANNA KOHVAKKA, director of the non-profit circular economy organisation From Waste to Taste, agrees with Albäck and notes that plastic in itself is not a bad thing. It only becomes a problem when it ends up in nature. 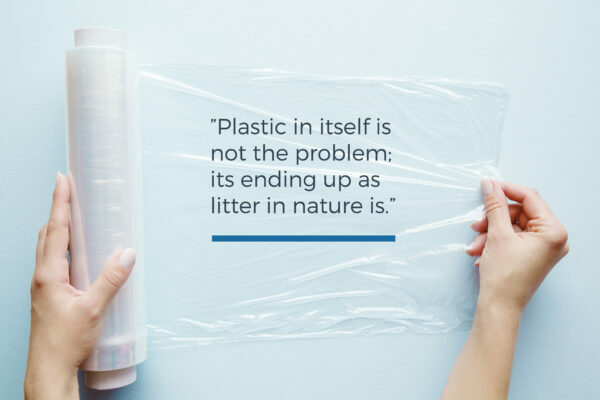 “I think it’s a good thing that the wide coverage in the news has made people aware of the problem with plastic, but people alarmed by the news have switched from excessive consumption of plastic to a total strike – in other words, from one extreme to the other,” Kohvakka says. It’s misguided to point an accusing finger at plastic manufacturers and demand that plastic should be eliminated entirely. She suggests that instead of boycotting plastic, people should favour smart consumption and life cycle thinking. “It’s misguided to point an accusing finger at plastic manufacturers and demand that plastic should be eliminated entirely. Plastic costs something too, so manufacturers don’t use it for nothing,” says Kohvakka. Albäck agrees and calls for life cycle thinking instead of considering only individual factors, such as plastic ending up in the environment. “When you look at the whole life cycle the picture changes. A study commissioned by the Ministry of Environment and Food of Denmark compared the environmental impacts of shopping bags made out of different materials throughout their life cycles. The research showed that the plastic bag is the best alternative for the environment compared to paper and fabric bags. When all the packaging materials are examined at the same level so that an impartial comparison is possible, we are on the right path,” Albäck says. ALTHOUGH THEY consider plastic a good material, Kohvakka and Albäck are both in favour of reducing disposable products. This is why the EU’s decision to ban plastic straws, cotton buds and take-away lids was welcome news to them, even though its effect on the overall picture will be marginal. “The objective of the EU’s plastics strategy is for all packaging plastic to be recyclable or reusable by 2030. Putting a stop to the single-use culture is a step in the right direction, but it’s vital to also develop the recycling of plastic. What’s more, we must carefully investigate the effects of potentially replacing plastic with other materials, because there’s a danger that it will increase emissions,” Kohvakka says. IT HAS BEEN estimated that a total of 25 million tonnes of plastic waste is generated in Europe every year, but less than 30% of it is recycled. Both Kohvakka and Albäck dream of a future where all plastic is recycled to an increasing extent, allowing the materials suited to recycling to be reused over and over. Opportunities for recycling exist already and in theory anything is possible. “As producers of plastic film, we at Rani Plast are not always able to influence the end products, but in our own product development we strive to continuously create new solutions to support the recycling of plastic film. We are also a shareholder of the non-profit organisation Finnish Plastics Recycling Ltd and, together with other operators, are working on developing solutions to increase recycling,” Albäck says. WHILE THE EU is about to ban some single-use plastic products, the greatest problem with plastic is in Asia. Waste management there is underdeveloped in many places and, as a result, plastic finds its way into nature and the oceans. “It’s clear that something has to be done about littering. Above all, this means changing people’s attitudes, making recycling more effective and promoting the circular economy,” says Albäck. Solutions which contain a mixture of different plastics, such as PET/PE, are often difficult to recycle and that is why Rani Plast is looking into replacing them with PE/PE solutions, containing only one type of plastic. For Rani and Rani’s customers, the circular economy brings many opportunities. Among other things, Rani is currently investigating how laminates can be made into more easily recyclable packaging. Solutions which contain a mixture of different plastics, such as PET/PE, are often difficult to recycle and that is why Rani Plast is looking into replacing them with PE/PE solutions, containing only one type of plastic. In addition, the company is researching new applications for plastic film made out of renewable sources of raw material, such as plants or wood. Rani Plast manufactures some plastic made out of renewable materials, but the company still favours plastics based on ordinary fossil raw materials due, in part, to the high price and poor availability of the raw materials for bioplastic. “We are also developing more and more high-quality and versatile types of recycled granulate in cooperation with recycling companies. The waste from our factories’ plastic production has been efficiently utilised for decades, and now we are looking for ways to improve the use of rejects both in production and product development. Versatile plastic serves numerous purposes, and together we can all promote sustainable development,” Albäck sums up.